I remember the first time I read a Brian McLaren book. “A Generous Orthodoxy” was something like an exotic trip in a forbidden land. It was like McLaren was giving voice to all the dark corners of my mind, expressing the thoughts that I (thought I) was forbidden from expressing myself. It was challenging, compelling, and wonderful. 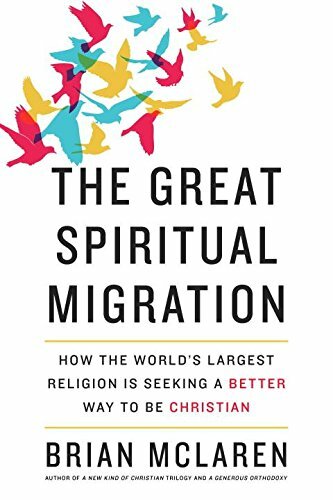 But as I read his new book, The Great Spiritual Migration, which comes out in September of this year, I found it to be a much different trip. The journey was predictable, and McLaren barely managed to venture beyond what he has already said again and again. It followed closely to one of his previous books, A New Kind of Christianity, which also left me feeling dissatisfied. Make no mistake: McLaren is provocative as usual. It’s just that by now, if you’ve followed him at all or read any of his previous books, you won’t find him to be provocative in any new ways. McLaren does well to demonstrate that the culture we live in influences our interpretation of scripture, and that systems of believe evolve over time. That’s a pretty basic assertion, and I can follow him at least that far. But he uses that as a platform from which to advocate specific changes, ostracizing those with whom he disagrees. McLaren’s topic of choice is (also unsurprisingly) homosexuality, and he says (to broadly summarize) “This is how Christianity must evolve its way of thinking concerning this topic,” because, as he has already described, that’s what Christian faith does – it evolves. What is most off-putting, though, is the way he ostracizes those who hold dissimilar views, painting them with a brush that is far too broad, and suggesting that they represent outdated ways of thinking that Christianity will leave behind. There is no nuance in his presentation concerning those who hold different views. The way Christianity is moving, he suggests, is to fully embrace all aspects of homosexuality. Anyone who disagrees is painted in the same way: narrow-minded, outdated, and harmful to persons and Christianity in general. McLaren makes the same mistake that is made again and again concerning this issue: he fails to leave room for a third way (something that he will criticize later in this same book, but apparently fails to notice that he is doing in this early section). We’ll never be able to have productive conversations about this subject if we fail to realize that there is room to discuss it in the middle, without demonizing people with different perspectives (and to be clear, it’s not McLaren’s perspective that I’m criticizing, it is his approach to it), and while exploring the various nuanced perspectives and approaches. Not everyone who finds themselves continuing to describe homosexuality as sin is bigoted, small-minded, or unloving, just as not everyone who advocates for full inclusion is “choosing culture over scripture,” “ultra-liberal,” or whatever other terms might be used to dismiss them. (I confess to feeling quite vulnerable writing even as much as I have here, because I am likely to be grouped with one side or another of this debate, and the reality is that I don’t fit any side, because I really believe this conversation has to be approached with a great deal more nuance than it has until now). It is unsurprising that McLaren’s next move is to appeal to love. Again, it assumes that anyone who disagrees with his perspective is failing to love. I understand the temptation to think in that way, and the argument that surrounds that way of thinking, but I also know numerous examples of Christians and Christian leaders who have struggled and wrestled with these ideas, and who disagree with McLaren, but who have never failed to love. Furthermore, I’m not convinced that we’ve adequately defined “love,” which is a necessary starting point for this conversation. The second section of McLaren’s book details the horrors of Christianity’s past, and insists that the future for Christianity in a non-violent approach that stands in contrast to our admittedly violent history. I agree with McLaren’s insistence on a non-violent way forward (I would go further than he does in this book, in fact, and insist that we are to be active peace-makers, not simply passively non-violent). In the third and final section of the book, McLaren explores Social Movement Theory (which is quite interesting), probes the important and highly relevant idea that salvation is a this-life concept (rather than merely an afterlife concept), and discusses the importance of social change as a response to what he refers to as the “Suicide Machine,” which is his way of describing the ultimate consequences of our violent and consumer-driven, resource-consuming systems which devalue human life and environmental well-being in favor of making money and providing contemporary luxuries (McLaren previously wrote about the Suicide Machine in Everything Must Change). McLaren highlights a path toward change, continuing to paint the world with a brush that is too broad. It is often frustrating to hear someone who is not a pastor talk about what pastors need to do, because they are not “in the trenches,” so to speak, dealing with a system that moves impossibly slow. I grant that McLaren is a former pastor, but I can’t help but wonder, as I read this, if he remembers what it is like to speak with someone who is thoroughly convinced that Christianity looks the way they have imagined it, even when you’re offering them something that is so much better (and more faithful). I’ve been admittedly critical, and perhaps almost too critical. I think there’s quite a lot of value in much of what McLaren says and the approach he takes and advocates, but I also think that there are many ways (many of which I have tried to highlight) that he misses important ideas, overlooks similar but nuanced perspectives, paints his opponents in broad strokes, and engages in the all-too-typical practice of making the art of an argument more compelling than the argument itself (which is to say, he makes a convincing case for things that, when evaluated fairly rather than through the compellingly articulated words of the author, are not all that convincing). I received a prerelease copy of this book so that I might review it on this blog.